To the north of Ocean Drive, beginning around 15th Avenue North is the family beach called Cherry Grove. Well-known for its pier, and because it seems the most far away from Main Street, many think Cherry Grove is a separate city. However, it is part of the city of North Myrtle Beach. The first mile or two of the boulevard consists of oceanfront mansions on the beach, and residential homes across the street to Hwy 17. The first large condo resort heading north is across from the beach. The Tilghman Beach and Golf is one of the newest resorts, and offers great amenities including public tennis courts and nearby golf on the Surf and Golf Club behind it. Directly behind the resort, you'll find a wonderful residential condo complex called Tilghman Lakes. If you ever wanted to live right on the beach but not in a tower, you'll need to ask about these. Back on Ocean Blvd about a block further on the same side of the road, are several mid-rise buildings of condos called Ocean Terrace. The first oceanfront high-rise coming from the south is Towers on the Grove. Spring Towers is next, and then comes the "main street" for Cherry Grove, called Sea Mountain Highway. Vacationers love the convenience of this location, with a large grocery store, hardware store, seafood and several other restaurants. Just past Sea Mountain Hwy is another high-rise on the beach called The Oceans. There are many beach houses in Cherry Grove, and the next several blocks have no large condos. The next medium sized condo resort is the Shalimar, at 29th Avenue. More houses and small condo buildings follow until you get to the Cherry Grove Pier at 36th Avenue. Just before it are the Pier Watch Villas, and then Prince Resort, a colorful and lavishly huge twin-tower resort that overlooks the pier and has all the expected amenities. Continuing north, we see the Buena Vista tower and the Beachwalk Villas across from the beach. Only smaller condos and homes follow till you near the end of Ocean Blvd. The Cherry Grove Villas across the street and Paradise Pointe oceanfront are next up, followed by Sunrise Pointe, and the elegant Laguna Keyes. You won't want to miss that one! 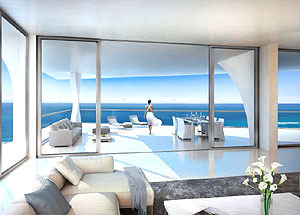 Xanadu II follows on the oceanfront, then the low-rise complex called Sea Cabin. Almost at the end of the boulevard is Sea Marsh and then Ocean View Villas at the end of the beach side. The last large gated complex is on a curve after the road ends and Channel-front, called Inlet Point Villas. Any of these condos are popular and well-built. If you want to see any of the condos for sale in Cherry Grove, call us and we'll take you down the boulevard in a car instead of a web page!